Based in our Beenleigh Office Kathryn Ryan has extensive experience within the financial planning industry. Kathryn has been in the industry since 1998, becoming an adviser in 2004. Over the last 8 years she has held financial advising roles with Whittaker Macnaught and Westpac. Kathryn tailors her advice specifically for her individual clients. She believes that a sound financial plan that is implemented and reviewed regularly provides clients with a greater chance of success in attaining their personal and financial goals throughout their lives. Through the ongoing service proposition clients are able to monitor and enhance their plans with regular reviews and market updates. Kathryn prides herself on her ability to forge long standing relationships with her clients. Her specialist skills are in the areas of Wealth Creation, Personal Insurance, Retirement Income, Retirement Planning, Centrelink Strategies, Self-Managed Superannuation Funds and Estate Planning. Kathryn moved to Brisbane in 2005. She has a partner, Mark, and one son, Nicholas. In her spare time she enjoys spending time with her family and reading. But she is also a keen home renovator and gardener. What Kathryn's clients say about her. For more client reviews click on Advise ratings link on this page. What Qualifications And Professional Memberships Does Kathryn Have? Kathryn holds a Graduate Diploma in Financial Planning through Finsia. 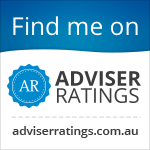 Kathryn is a member of the Financial Planning Association of Australia. Kathryn has completed specialist courses in the area of , Gearing and Insurance in Self-Managed Super Funds and Margin Lending.